07/2010: The city of Camden received a $460,513 grant from the New Jersey Historic Trust in 2004. The grant helped fund stabilization of the library and planning documents. The building is located within the Broadway Redevelopment District. The city has plans to restore the building eventually, but no date has been set as funding is limited. In the meantime, the building continues to deteriorate. 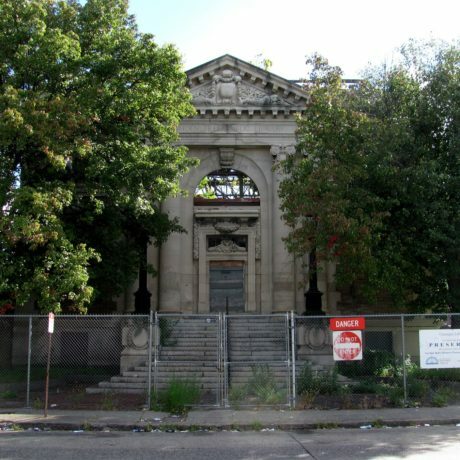 The Camden Free Public Library, also known as the Carnegie Library, was completed in 1905 with a grant totaling $120,000 from renowned philanthropist Andrew Carnegie. It was Carnegie’s belief that universities and libraries were the most worthwhile areas to give donations, and he made major donations to over 2500 libraries across the country. The firm of J.E. and A.L Pennock built the two-storied, neoclassical library. It was finished with a pedimented entrance portico on the west façade. When there were no funds left to purchase furniture for the library, Andrew Carnegie donated a supplementary $20,000. The library opened on June 27, 1905, and was housed at its original site for eighty-one years. In 1986, the library was set up in a larger building, leaving the original Camden Free Public Library empty. The building was placed on the National Register of Historic Places in October of 1992 and still stands as a symbol of the City of Camden as well as a symbol of the generosity of Andrew Carnegie. The building has deteriorated severely.